Brian Michael Bendis is a writer that needs no introduction. He is considered to be the head writer at Marvel and has been making Ultimate Spiderman and the Avengers his own for many years. He has an ability to write in depth character dialogues, which is where his best work lies. He has never written one of the main X titles, and since he is now free from the reigns of Avengers, it is an exciting prospect. Stuart Immonen has written many DC and Marvel titles over the years and I have enjoyed his art on the Fear Itself crossover and his work on Ultimate Spiderman. 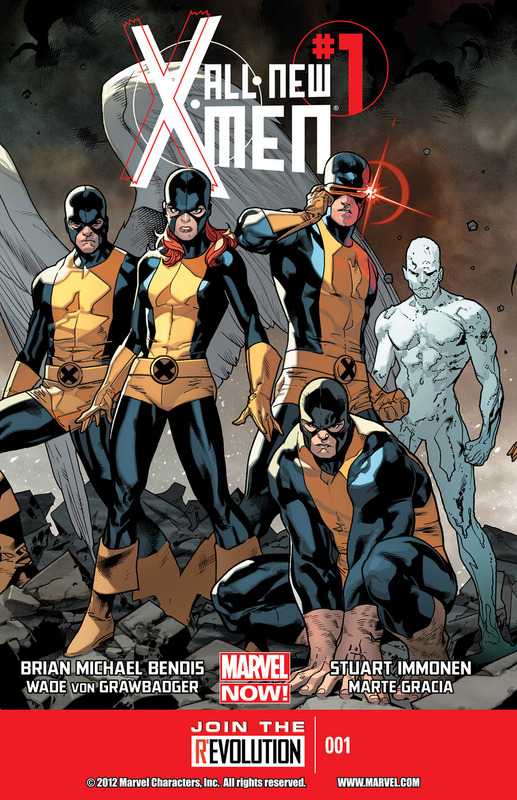 They are jumping on the X-books with a brand new title called All New X-Men and it is the lead X title. Post AvX times have changed and the Jean Grey institute is still schooling mutants but Cyclops has gone rogue and is trying to “save” the new mutants that are arising. The first two pages of this book are phenomenal and set the tone, story, and tribulations of the whole arc. Hank McCoy is in pain and his anguish is so visceral as he contemplates his future and that of mutantkind. He prays that he will live to leave a legacy that will put the world right for mutants. It is a rare and wonderfully emotional start to a comic. The mutants of the world are in chaos, the x-men are in chaos and Beast is struggling with the fact that his once best friend is now against him. This is the premise of the book and highlights the fracturing of the X-Men. The narrative is solid and the X-Men’s deliberations are well written and believable. In between these scenes we have Cyclops, leading Emma and Magneto, in action trying to build a new mutant collective. They come save a teenager during the embodiment of her newfound powers and Scott delivers his new mutant treatise. His voice has changed as we hear repentance, assurance and hope, which is exactly how Cyclops should be as his role as leader of the opposition X team. There are exquisite subtle lines of humour in this book and hints of the oncoming developments. It is a well written book with excellent character development and action. I have already alluded to the excellent emotional display of Beast on the first two pages and this continues throughout. The stern, emotionless aggression of Scott’s team parallels with the concern, worry and despair of the X-Men. The manifestation of a young mutant’s power is brilliantly drawn and epic in its nature. I really do not want to spoil what her powers are, as they are shown beautifully. The Cyclops X team enters the scene looking like they are about to cause some serious damage as they are drawn with purpose. The following action sequence is a fantastic single page spread emphasising the sheer power of the trio. The colours are bright, the wanton destruction is palatable and clearly no one is stopping them. Without spoiling the plot, the final pages of the book set up the strategy of the school against Scott. It does involve time travel and it is drawn with excellent detail, as the two sets of heroes are recognisable and easily distinguishable. This will play importantly into further issues of the arc. Throughout the last two years the schism of the X-men has been between Scott and Logan, and his omission from this book is a concern. AvX consequences spent many a page developing this relationship and it ended with Cyclops the villain. I can understand that with the time travel aspect of the story this may not be important, but it feels wrong not to have him involved. I do welcome the apparent promotion of Beast to a stronger role in the team. My other concern lies with the use of time travel. Over the years it has been used judiciously as temporal dynamics are incredibly difficult to grasp and understand. It is rarely used consistently and many any writers manipulate it how they please. The book gives the impression that it is a straightforward and simple strategy to combat Scott’s X-Men. It certainly will not be and I worry that the analytical and obsessive part of my nature will bring out absurdist in me. If the narrative is focused and played out well then hopefully it will not hinder the story. Overall this is an excellent starting point for Brian Bendis and Stuart Immonen, and I hope the book accelerates into greatness as it certainly has the potential to. Previous PostAvX Consequences – Tell me, what’s changed?